The following table shows what level attack you need to wield a hatchet, and what level woodcutting you need to use each hatchet. If you cannot wield the hatchet, you may still use it as long as you have the required woodcutting level and have the hatchet in your inventory. Regular Tree 25 No Everywhere. 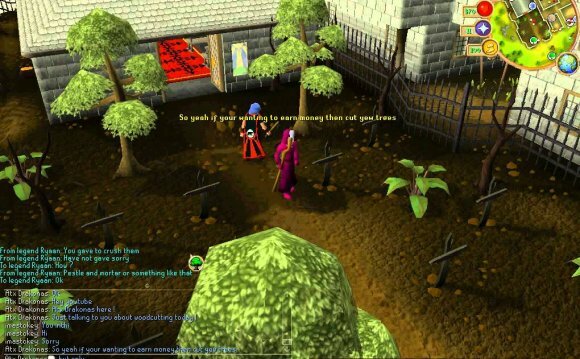 Dead Tree Wilderness, Draynor Manor Map, and Goblin Village. Achey Tree Yes South of Castle Wars, and north of Oo'glog. islands northeast of Mos Le'Harmless. Corporeal Beast is found in. West of Sinclair Mansion, and on the Daemonheim woodcutting island. and in southeastern part of the Tree Gnome Stronghold. in the Varrock Sewers Resource Dungeon and at the farm ruins (Wilderness level 23). While training the Dungeoneering skill, you will occasionally see different types of trees that you can cut down. The branches you receive can be used in either the Firemaking or Fletching skill. You will only be able to cut trees in dungeons with a Complexity level of 2 or above. For more information on what you can make with these branches, please refer to our Fletching guide. Below is a table showing all the different kinds of hatches available to you while Dungeoneering. Below is a table showing all the different kinds of trees that you can cut down while Dungeoneering. In the Tai Bwo Wannai Clean Up activity you need the help out the villagers by cutting back the jungle plants around their village and repairing the fence, that surrounds the village. To start helping the villagers, you must have completed the Jungle Potion quest. Additionally, you need a manchete to cut down these plants. Below, you can find a list of the jungle plants you might encounter and the available machetes. For more information on the activity, refer to the Tai Bwo Wannai Clean Up activity guide. Lumberjack clothes are a possible reward from the Temple Trekking/Burgh de Rott Ramble activity. When worn, each piece will give you an additional amount of experience while cutting trees. The complete set will yield you a 5% experience bonus per log chopped. Occasionally, a Bird nest will fall out of a tree. If you search a nest you might receive items such as Rings, Seeds for Farming, and Bird's eggs. The bird's eggs can be incubated and raised as pets using the Summoning skill. Empty nests can be ground up and used to make Saradomin brews. Note: Wearing a strung rabbit foot increases your chance in receiving a bird nest. Your woodcutting skills can be used to make canoes for travelling along the river Lum, which runs from Lumbridge up to level 35 wilderness. To cut a canoe out of a tree you will need a hatchet as well as a certain Woodcutting level (see table below). For any questions about Canoes, you can talk to the nearby stationguard. Head to one of the stations and cut down the unusual big tree there. Click on the fallen tree and select the canoe you want to make. Push the canoe into the water by clicking on it. Click on the canoe and select where you want to go. Remember, higher level canoes can float further than the others, and give more woodcutting experience. It is there advised that you build the highest level canoe you can make. Champions Guild, at the east side of the river, just west of the wheat field. Barbarian Village, at the east side of the river, south of the bridge to the village. Edgeville, at the east side of the river, south of the bridge. Level 35 Wilderness, the little lake south of where the Moss Giants are, between Red Dragon Isle and the Lava Maze. Only Waka canoes can come here. WARNING: You cannot go back from this station! Required How Far It Can Travel. Log 12 One station away, cannot enter wilderness. Dugout 27 Two stations away, cannot enter wilderness. Stable Dugout 42 Three stations away, cannot enter wilderness. Waka 57 150 Any station on the river, including the wilderness exit.